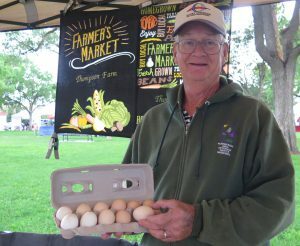 Thompson Farm sells certified-organic eggs and produce. Bob Thompson runs organic-certified Thompson Farm, which sells eggs and an abundance of produce including apples, strawberries, blackberries, grapes, tomatoes, eggplant, beans, beets, carrots, and squash. Downtown Growers’ Market on Saturdays from 8 AM to noon at Robinson Park (at 8th and Central) in Albuquerque. Cedar Crest Farmers’ Market, on Wednesdays from 3 PM to 6 PM at the old Cedar Crest Flea Market location, on the north side of Triangle Market. Bob was market manager at Cedar Crest Farmers’ Market for many years. Bob grew up farming; his grandparents were dry-land farmers and Bob spent summers helping on their farms and building one of the biggest hog operations in New Mexico at that time. In 2008 Bob decided to start his own farm, and purchased two acres in Edgewood, which became organic-certified in 2011. Thompson Farm boasts three hoop houses and 200 to 300 fruit trees, along with fields for his produce. Following in his grandparents’ footsteps, Bob is water conscious in his farming practices and harvests over 35,000 gallons of rain water each season to grow his crops instead of tapping into valuable groundwater resources. Despite weather challenges such as hail, Bob finds farming to be relaxing and he enjoys working in the soil; he plans to continue farming as long as his health allows. When he’s not farming, Bob flies WWI and WWII model air planes that he builds from scratch in his dedicated workshop.